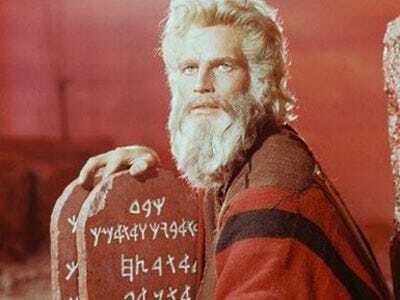 The Federal Reserve is about to make major moves that will alter the post financial crisis framework markets have become accustomed to. The impact is already being felt in some quarters of the economy, as the uber-easy credit era shifts to something less fluid. 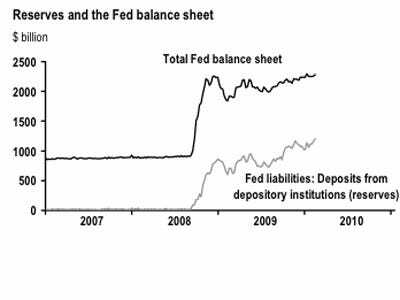 The Fed's balance sheet has stabilised and is now showing an end to the expansion that defined the post financial crisis era. It has, however, taken on a massive amount of securities and loans to provide this stability. 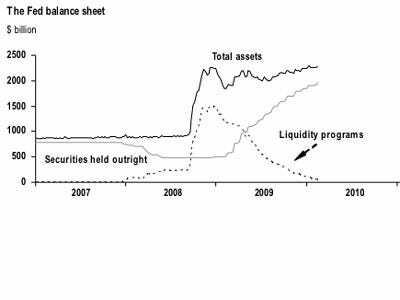 While the value of securities held on the Fed balance sheet continued to trend upwards, acquisitions have halted as liquidity programs are coming to a close. Treasuries, which once dominated the balance sheet at the Fed, are now dwarfed by other securities that are on the bank's books. 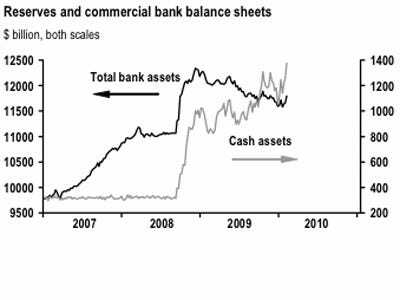 During the financial crisis, the Fed began to take on more reserves to fund the needs of the market. The impact was to bring down interest rates, which was not a problem at the time, because rates were being held at that level. Now the concern is that by holding these reserves, the Fed could be increasing inflation in the market, though this possibility is disputed by the Fed itself. 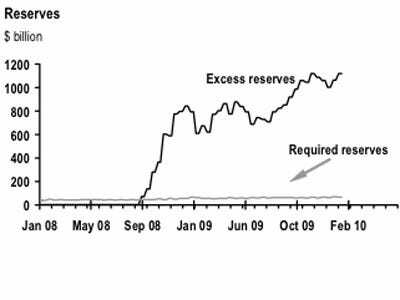 Now the reserves that kept lending alive are far above the required amount. 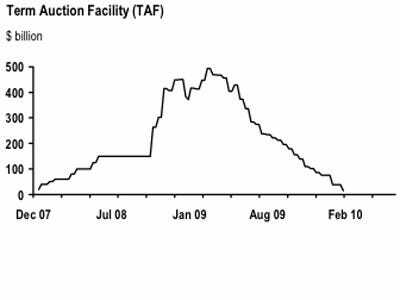 While one possible impact is inflation, there are concerns that since these reserves have been used to fund the purchase of private sector items, like mortgages, that they are in fact aiding deflation by reducing the value of those assets, without increasing the private sector money supply. 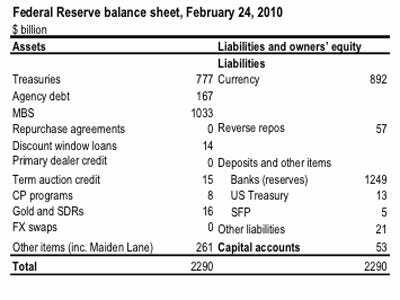 A higher quantity of reserves on bank balance sheets has the result of reducing the overnight lending rate, which can reduce the Fed's control of interest rates, if they choose to raise them. 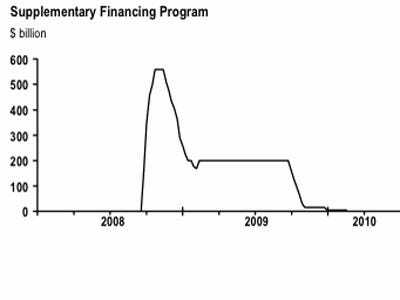 The Supplementary Financing Program has seen itself reduced because the amount spent through it is counted against government debt ceilings. But it may be used in the future to mop up some of the reserves in the market, if the Fed is trying to get active about raising interest rates. The Term Deposit facility could also be used, which would have the impact of the Fed buying back reserves for another liability entering the market, term deposits. Finally, the Fed could use a reverse repo facility to take reserves out of the system in the short term. 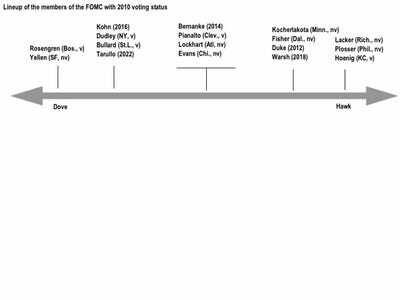 It is likely the Fed will use a combination of the Supplementary Financing Program, the Term Deposit facility, and reverse repos to take reserves out of the system. Moves will signal the market that the Fed intends to raise rates. While the Fed is still trying to get the effective funds rate back under its control through the reserve market, the interest on excess reserve rate will be the Fed's focus. 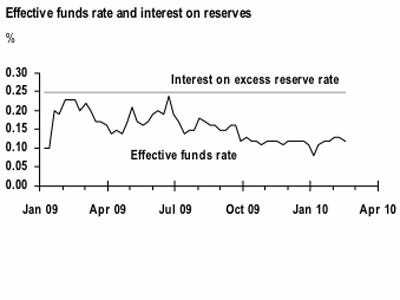 This is because the IOER can push the effective funds rate in a particular direction, drawing it closer the the Fed's preferred point, while the reserve market issue is dealt with. 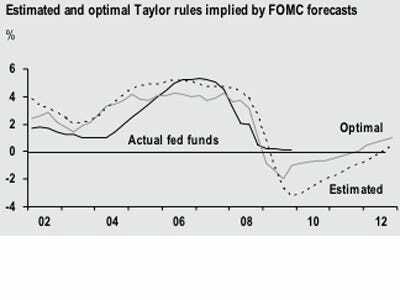 The Taylor rules for when to expect a rate hike point to two different results. 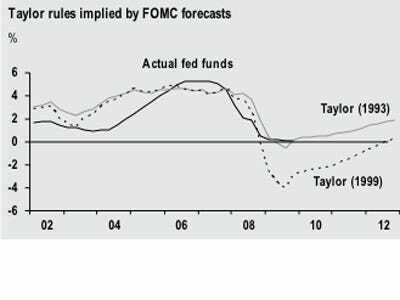 While 1993 rules suggest we should prepare for a rate hike later this year, 1999's factors would say Q2 2011. Both, however, point towards a small rate hike, maxing at 2%, by the end of 2012. This would be signaled by advance moves to deal with the problem of excess reserves in the system.